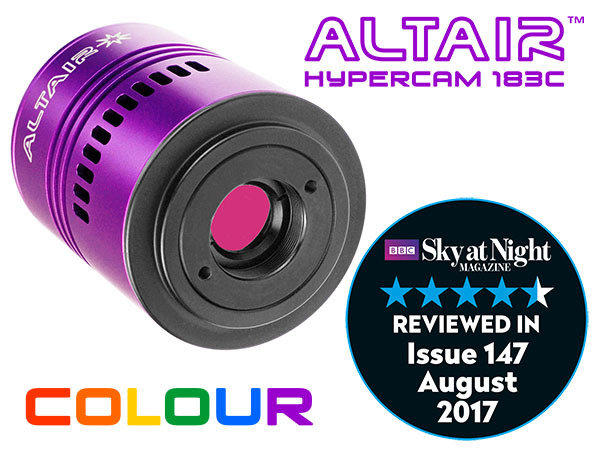 The Hypercam 183C Colour camera is the thinkers' alternative to a DSLR camera when it comes to astro-imaging. It has a 20mp Sony IMX183 sensor, featuring amp glow reduction and high sensitivity for extremely smooth, detailed images. The IMX183 is one of the most sensitive Back Side Illuminated BSI sensors available, with very low read noise, suitable for both deepsky and solar system imaging with ROI. 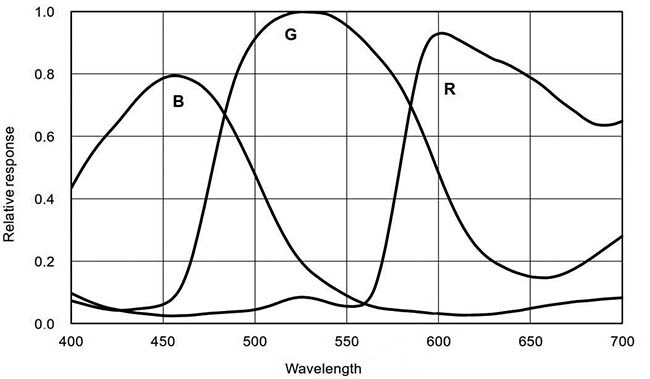 ROI (Region of Interest) for cropped higher speed solar, lunar and planetary imaging. Fan-cooled on-sensor internal heatsink, powered though USB cable, so NO separate 12v power supply required. SPECIAL OFFER! FREE 1 YEAR SharpCap PRO License! Includes ultra-accurate polar alignment assist, deepsky CMOS exposure time optimisation assist, live stacking for EAA/Video astronomy, live darkframe and flat frame subtration. Click here for more SC PRO features. Just download the latest SharpCap, connect your camera, register when the screen pops up and sign up for your free license. Download SharpCap 3.0+ now to take advantage of this special offer. Easier than a DSLR and no "astro modding" required: Hypercam is much easier to use and focus than a DSLR, thanks to the live preview mode which shows uncompressed video at full resolution. You can see a tiny star-point clearly in real-time, because there is no video compression like with a DSLR video stream. Unlike a DSLR, there's no need to modify your camera to capture detail in red hydrogen wavelengths, because it has no red blocking filter in the way. There are no clumsy power connectors which drop out easily, no firmware to fight with your software, no mirror to lock up, and a "true" uncompressed RAW mode output. You get exactly what this Sony sensor "sees" from without alterations. Low read noise. The Sony IMX183 CMOS sensor has very low read noise, wide dynamic range, and high sensitivity. The IMX183 ExmorR rated Back Illuminated Sensor has high-sensitivty, low dark current, no smear, and excellent anti-blooming charateristics. BSI technology moves the sensor circuitry behind the pixel, so unlike conventional sensors the light path is not blocked, resulting in higher quantum efficiency than a CCD sensor. Great for refractors. With a pixel size of 2.4um, and an active imaging area of 13 x 9mm, the Hypercam IMX183C performs extremely with or without a focal reducer. 4GB DDR3 RAM: The Hypercam PRO series also has an unprecedented 4GB on-board frame buffer to improve data transfer stability at high frame rates (to reduce dropped frames) and to increase compatibility with a wider range of PCs. The improved buffers give a more consistent data transfer rate over USB2.0 and USB3.0 allowing longer imaging sequences with small notebooks, stick PCs, or mini-PCs. Low read noise BSI sensor. The Sony IMX183 CMOS sensor is ExmorR rated, and Back Illuminated (BSI). BSI technology moves the sensor circuitry behind the pixel, so unlike conventional sensors the light path is not blocked, resulting in higher quantum efficiency than a traditional CCD sensor. Read noise is low, and there is no smear or “blooming” on bright stars. Try deep-sky "lucky" imaging. The low read noise let’s you stack shorter exposures to take advantage of the low read noise, reducing atmospheric aberrations and tracking errors or wind vibration. The more frames you stack, the smoother the image becomes, and the higher the cumulative dynamic range. In this way, long cumulative exposure times of many hours can be achieved with modest equipment. The result is a smoother, sharper image with more detail. Video Astronomy/EAA Friendly. The Hypercam IMX183 sensor is not only desirable for Deepsky Imaging - it's also great for Video Astronomy or "EAA" Electronically Assisted Astronomy. All thanks to the 20mp resolution, high sensitivity, and amp glow reduction technology. What's more you can use the Live Stacking features in the AltairCapture software or SharpCap PRO. All-sky time-lapse imaging or video is easy with a DSLR lens and optional Hypercam Lens Adapters (product code: CLA-EOS or CLA-NIKON). Pure RAW video and stills mode and "digital" RGB output modes for better post processing: The Hypercam sensor ADC can deliver 12bit RAW files, which are stretched to 16 bit. In RAW mode analog (on-sensor) gain is used for ultra low read-noise images. Because the output is completely "RAW" in analog mode, there is no partial "downstream digital" processing like with a DSLR or other cheaper Chinese cameras of similar design, resulting in true RAW mode for the best deepsky performance. True RAW mode allows greater flexibility and consistency in processing large stacks of frames for deepsky "lucky" imaging, where the camera's low read noise can be taken advantage of. Either .FITS image or .SER video files are captured in their purest form for later processing in your software of choice. Of course for Video Astronomy / EAA use, you can select RGB Mode and capture .AVI files, or just view the screen with full access to white balance, gamma, contrast and histogram controls, just like any other camera. USB3.0 speed and USB2.0 reliability: USB3.0 gives much faster transfer speeds than USB2.0 cameras, however, if like most imagers, you prefer to use longer and more flexible USB2.0 cables for better tracking and reliability with a USB2.0 hub, no problem! The Hypercam is completely compatible with USB2.0 or USB3.0. Just plug and go! AltairCapture: Unlike cheaper cameras, Altair Astro has spent considerable time improving the extensively featured and intuitive AltairCapture software, which can be downloaded from cameras.altairastro.com. AltairCapture is a stable 64 bit Windows application, which allows full control of the camera in high speed video or still mode. It includes extensive automation features, and supports all the major file formats useful for astro imaging and professional scientific imaging in 16bit, 12bit or 8bit mode. Furthermore, the popular PHD Guiding, SharpCap and Firecapture are also natively supported. ASCOM drivers are also available for download at cameras.altairastro.com where you can also get regular driver updates. SharpCap PRO: Altair Astro have worked closely with SharpCap developer Robin Glover since 2015, to fully integrate Altair cameras with SharpCap at a basic level. Now, Sharpcap PRO enables even more features with this camera, such as software driven polar alignment (more accurate than any other method), live flat frame subtraction and live darkframe subtraction. The fast, accurate polar alignment feature in SharpCap PRO is a life-saver for imaging, minimising setup time. Autoguiding: The camera has an ST4 auto-guiding port, and can be used to auto-guide with mounts from all the major manufacturers supporting ST4 format, including iOptron, Celestron and Skywatcher. The IMX183 is more than sensitive enough for autoguiding. Fan cooling: The Hypercam is cooled with and internal low vibration fan. The fan can be switched on or off and the speed controlled in AltairCapture and SharpCap. Cool air is drawn in through the vents at the side of the casing, over a large internal heat-sink. The heat-sink is connected directly with the sensor board just like a computer CPU. The free flow of air through the casing cools not only the sensor, but all the internal electronics boards. Cooling is especially desirable for long exposure imaging to reduce thermal noise. Some camera casings get uncomfortably hot during a solar imaging session, and the sensor can reach around 60 or even 70 degrees. This can cause the electronics to become glitchy and unreliable. The Hypercam is therefore a good option for consistent, reliable solar imaging with a solar filter and diagonal, or Altair Solar Wedge. With the fan running, the Hypercam casing, electronics and memory will always remain cool, protecting the electronics even on the hottest days. Support & warranty: Altair delivers proper on-shore English-speaking UK/EU support with a 2 year manufacturer warranty against defects in materials and workmanship. New users should visit Altair Camera Google User Group where you can get answers to technical questions. The group is also a great place to share tips and techniques, to get the best out of your camera. The AltairCapture software interface supports most European languages including English, German, French, Indonesian, Japanese, Korean, Polish, Russian, Chinese, Spanish, Thai, and Turkish. File formats: The camera can be fully controlled in AltairCapture and SharpCap to output uncompressed .AVI and .SER video files for solar system imaging, as well as all common still image formats such as .JPEG .PNG .TIFF .BMP, and .FITS (for deepsky imaging) to mention just a few. The Hypercam supports 8bit or 12bit output. The 12 bit output mode can be used for deep sky imaging with less frames needing to be stacked and a wider pixel intensity range. The sensor is extremely sensitive and a good candidate for video astronomy, especially with small refractors. Find out more about bit depth here. Find out more about video & file formats here. The Hypercam platform: The Hypercam platform supports “Trigger Mode” to make long exposures of over 5 seconds easier to control. With most cameras, in normal video mode, you have to wait for an exposure to complete before the camera will accept, say a command to abort the frame, for say clouds, aircraft, or an alignment issue, like kicking the tripod and so-on, changes in gain, exposure time, or re-aligning or refocusing. For long exposures, normal video mode is inconvenient, especially for video astronomy and deep-sky imaging, however in Trigger Mode, you can stop the camera instantly (even if you are half way through a long exposure) change the settings, and re-start the camera. 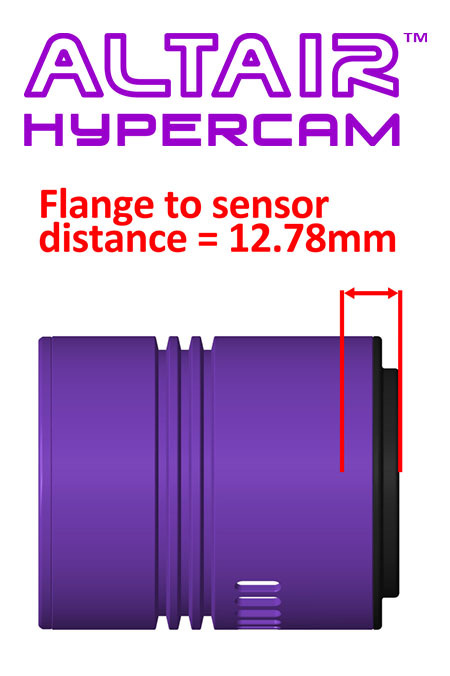 The Hypercam also has an improved on-board frame buffer to improve data transfer stability at high frame rates (to reduce dropped frames) and to increase compatibility with a wider range of PCs. The improved buffers give a more consistent data transfer rate over USB2.0 and USB3.0 buses on laptops and desktop PCs. Camera body with internal cooling fan, heat-sink, and front female M42x0.75mm T-Thread interface (12.5mm backfocus). 2" OD Nosepiece with standard 2" M48x0.75mm filter thread on the front. (code ALTAIRH-2IN). C-Mount insert ring (for C-Mount lenses requiring 12.5mm back-focus) is included. * Based on average user reports. May be revised as we get more data. The shorter the exposure duration, the faster the frame rate. An expensive PC does not guarantee a fast frame rate because PC bus and main board architecture vary. NOTE: Windows 10 is recommended for best performance, with 2013 or later USB host controller v1.0 or later. USB Port & Cable: 3.0 USB Cable, 1.8m cable (USB2.0 also supported at low frame rates). C-mount lens compatibility: C-Mount male threaded lens with 12.5mm back-focus (or flange-distance) requirement.